Ten year-old Laguna Beach resident Everett Capelle won his third consecutive national championship in a 1,500 meter run at the USA Track and Field youth championship with a time of 4:51:14. Ten year-old Laguna Beach resident Everett Capelle rounds the track in Pennsylvania. He also shaved seven seconds off last year’s 800 m meet performance to move up three places and win gold with a time of 2:26:73. Nearly 3,000 of the best youth athletes from around the country qualified to compete by meeting national performance guidelines in local meets leading up to the championships held in Millersville, Penn., June 28 to July 3. Athletes competed in age-group competitions from under 8 to 17-18 in all track and field events – sprints, hurdles, distance races, jumps, and throws. 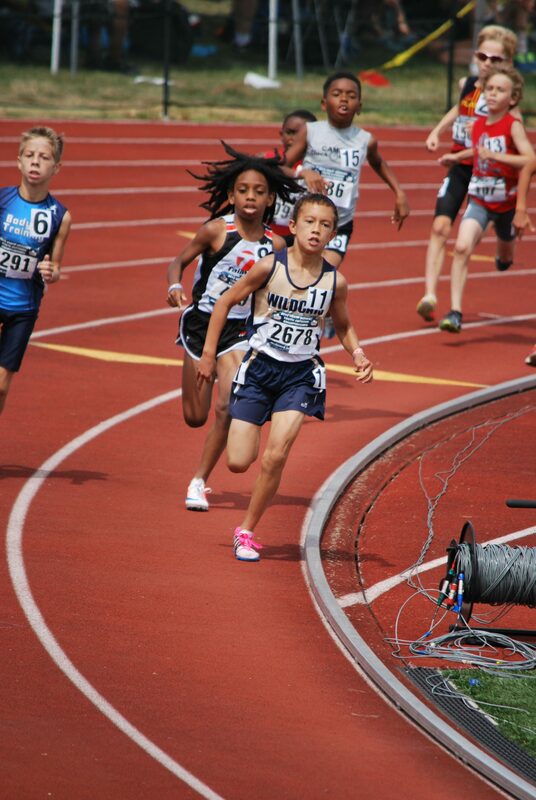 Capelle was one of 15 athletes from the Aliso Viejo-based South Orange County Wildcats Youth Track Club who qualified and traveled to compete at the national championships. The team brought home five gold, seven silver, and two bronze medals, and an overall second place team trophy for the 11-12 year-old girls. The teams coached by founder Darren Phelps has brought home awards each year since its inception in 2004. The team’s other gold medal winners this year were Amelia Kang of San Juan Capistrano in the girls’ 11-12 year-old 1,500 m and 3,000 m races and Ben McKenna of Laguna Niguel in the boys’ 13-14 3,000 m.
Everett’s 13-year-old brother, Calvin, placed 15th and 17th in the boys’ 13-14 year-old division in the 3,000 m and 800 m races, respectively. The Capelle boys started their running careers several years back by racing in the Laguna Beach City Meet held each March. Both boys broke and currently hold city records in multiple distances. Team registration is open to ages 7 to 17. More info: www.socwildcatstrackclub.com. The author is the parent of three runners on the team.